“Adriatica” is their debut full-length CD release, packed with 12 blistering surf rock instros, some with a slight punk/indie rock influence. There are 11 originals, plus a cover of Man Or Astroman’s “Interstellar Hardrive”. 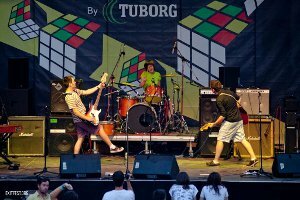 They beat out 400 bands in the Balkan region, receiving a recording contract and have since appeared at summer music festivals in front of huge crowds, and were recently featured on MTV. This is a band definitely on the rise, and this CD gives the rest of the world a chance to hear this band’s amazing, energetic surf rock sound.